Balayage isn’t just for your blonde babes and brunette beauties. 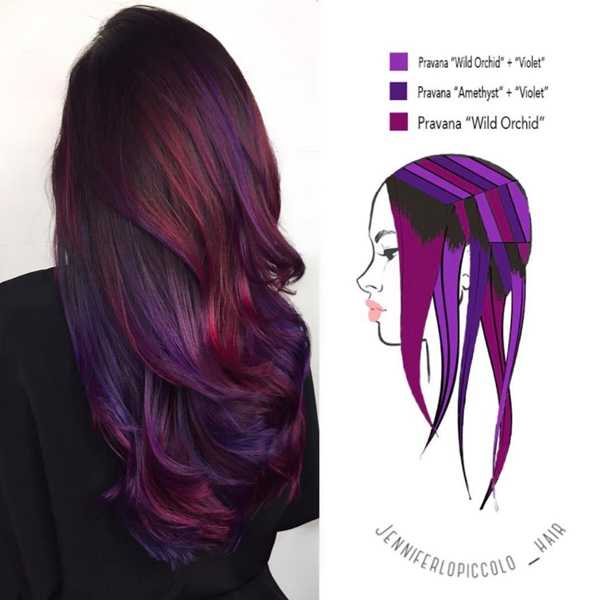 Your fashion color-lovin’ clients want to join the fun, too! With more than 15,000 likes on Instagram, we knew this color formula would be highly requested, so we got the how-to straight from Jennifer Lopiccolo (@jenniferlopiccolo_llc), a stylist and educator at Union Salon in Pasadena, Calif. Jennifer’s client came in for a total of three visits over the span of five months in order to achieve this luscious mix of purple shades, but it was worth it because this color is the definition of goals. 1. During her first visit, ombré using Formulas A and B. Starting in the back at the nape, work your way up beginning with Formula A and ending with Formula B. 2. Process until her hair reaches Level 8, then shampoo and dry. Next, apply Formula C.
3. On the second visit, apply Formula C again. 4. During her third visit, balayage with Formulas C, D and E. In a continuous pattern, apply each formula on 1-inch diagonal slices. After thoroughly applying each formula, cover her hair and have her process under a Wella Climazon2 for 20 minutes. Once the hair is cool, rinse with cold water. Style as desired.